GED4WEB will create 4 different categories of pages. You can select to create one, two, three, or all 4 types. By default, all 4 are created. If more than one category is created, you will find links between the two types of information. For instance, if you are on the Pedigree pages, you will find the persons name is a link to their family information on the Family Group pages. Most of these options apply to any and all languages created. There are a few areas that you can specify an option only applies to a specific language. Any option that can be language specific is noted in this help file. This category groups families together on a page. You will find the Husband & Wife as the center of the grouping, the husband's parents, the wife's parents, alone with all the husband and wife's children grouped together. If the children are themselves parents, you will find their names are links to a family group page with them as the center of the grouping. See my website for an example. 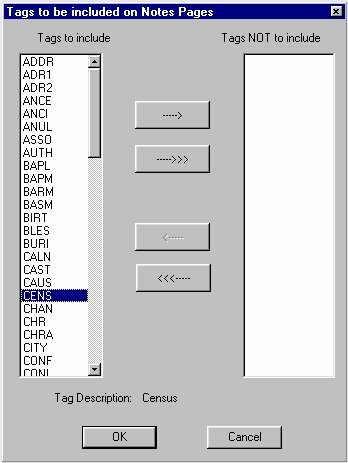 Customize Output Colors: If you don't like that all the names are the same color, you can specify what color Parents, Grandparents, and Children will be displayed in for easier reading. When you press the Customize output colors button you will get the following selection dialog. You can either select a color from the default list of colors by pressing the color button. Or, you can specify the RGB value of the color. If you don't understand RGB values, I recommend you use the color selection dialog. The RGB value will be displayed for whatever color you select. As you can see from the example, all Husband and Wife groups will have there names in RED, all the Parents will have their names displayed in BLACK, and all the children will have their names displayed in BLUE. There is one final option on this page. When you are on the General Settings dialog, there is an option to specify the text colors for all the test displayed on the pages. This option is called 'Use Custom Text Colors'. 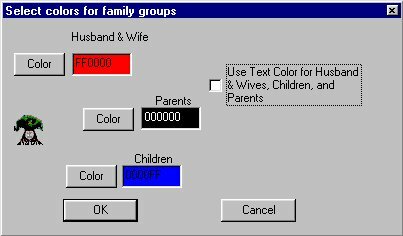 If you check the 'Use Text Color for Husband & Wives, Children, and Parents'. You will see the colors specified in 'Use Customer Text Colors' used for all names and text. Customize Page Titles: For the Family Group pages, you can specify what text will be displayed in the Internet Browser's Title Bar, as will as at the top of each page. When you press the Customize Page Titles button, you will see the following dialog. Here you must first check the radio button next to the language you wish to specify. If you have not creating a language, it's radio button will not be selectable. In this example, I have selected to create pages in English and Spanish. English is currently select in the dialog. The text before the page number will be 'Genealogy Data Page'. The text after the page number will be '(Family Pages)'. The end result is that ever family group page will have the following title. 'Genealogy Data Page 52 (Family Pages)'. 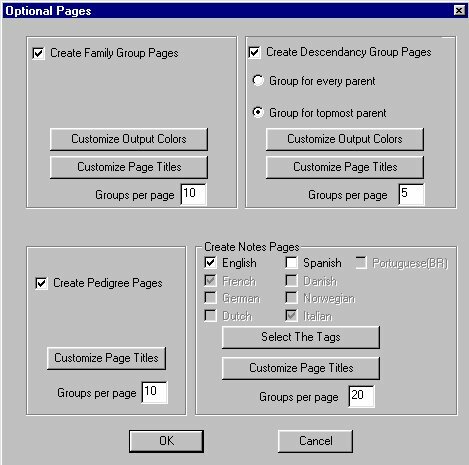 Groups per page: To save space and create less pages, I have designed GED4WEB to put more than one group or chart per page. The more groups per page, the less pages, but the larger each pages will be. The less groups per page, the more pages, and the smaller each page will be. I have tried to select the best balance between size and number, but you can change the values to better meet your needs. Group for every parent or Group for topmost parent: This option give you two choices, group for topmost parent, or group for every parent. If you group by topmost parent, GED4WEB builds a descendancy chart for the person (or couple) at the top of each branch of the tree, then all their offspring are linked in to those charts. This means that if an offspring is included in two trees (for example your maternal Grandparents, and your paternal Grandparents). You will see each name in the index pages, along with a link into each descendancy chart they belong to. See my website for an example. If you group by every parent, every person in the database that has children will get their own chart with them at the top. This option causes many more pages to be created, therefore increasing the total size of the files being created. Customize Output Colors: Each generation in the descendancy is printed in a different color for readability. You can change the default colors used for each generation from this screen. 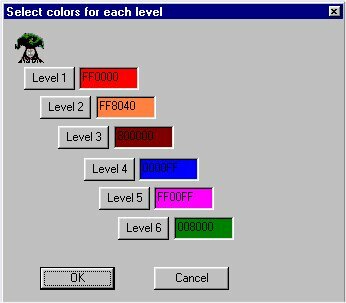 You can either enter in the RGB code for each generation, or press the Level button and pick from a list of predefined colors. For the Descendancy pages, you can specify what text will be displayed in the Internet Browser's Title Bar, as will as at the top of each page. When you press the Customize Page Titles button, you will see the following dialog. Here you must first check the radio button next to the language you wish to specify. If you have not creating a language, it's radio button will not be selectable. In this example, I have selected to create pages in English and Spanish. English is currently select in the dialog. The text before the page number will be 'Genealogy Data Page'. The text after the page number will be '(Descendancy Pages)'. The end result is that ever family group page will have the following title. 'Genealogy Data Page 52 (Descendancy Pages)'. These pages are designed to look like a pedigree chart. Each page will contain 4 generation. If there are more than 4 generations, the final generation will have a red arrow next to it which is a link to the next pedigree chart in the pedigree chain. For the Pedigree pages, you can specify what text will be displayed in the Internet Browser's Title Bar, as will as at the top of each page. When you press the Customize Page Titles button, you will see the following dialog. Here you must first check the radio button next to the language you wish to specify. If you have not creating a language, it's radio button will not be selectable. In this example, I have selected to create pages in English and Spanish. English is currently select in the dialog. The text before the page number will be 'Genealogy Data Page'. The text after the page number will be '(Pedigree Pages)'. The end result is that ever family group page will have the following title. 'Genealogy Data Page 52 (Pedigree Pages)'. These pages are designed to group together and print out all notes and sources for a person or marriage record. Since notes are usually written in one language (and I never alter the data in the GEDCOM file), I decided to give you the choice as to which languages to create notes and sources for. With the other optional pages, you automatically create them for every language you create. With notes and source, you can specify which languages notes and source pages are created for. Select the tags: You have the ability to select exactly which GEDCOM file tags are included in these pages. Pressing the 'Select the tags' button. brings you to the following dialog. By default, all tags are included in the Notes and Sources pages. Any tags that you don't want included, should be moved to the 'Tags NOT to include' listbox. Customize Page Titles: For the Notes and Sources pages, you can specify what text will be displayed in the Internet Browser's Title Bar, as will as at the top of each page. When you press the Customize Page Titles button, you will see the following dialog. Here you must first check the radio button next to the language you wish to specify. If you have not creating a language, it's radio button will not be selectable. In this example, I have selected to create pages in English and Spanish. English is currently select in the dialog. The text before the page number will be 'Genealogy Data Page'. The text after the page number will be '(Notes Pages)'. The end result is that ever family group page will have the following title. 'Genealogy Data Page 52 (Notes Pages)'.